Pumpkin Chai Soap, has a traditional Chai tea scent with delicious citrus notes of Bergamot and Lemon along with notes of Nutmeg, Cinnamon, Vanilla and a little bit of Allspice. This is a sweet, buttery scent. It has 100% pure natural Pumpkin puree and brown sugar added. No addition of color. Get the pure benefits of pumpkin fruit, essential vitamins and nutrients. Spiced Apple Cider Soap is made with pure organic Apple Cider! It’s a combination of fresh apples and juicy oranges blended with spices of cinnamon, nutmeg, and clove. Along with all the wonderful scents don't forget the Apple benefits that come along with it. Men love this one too! 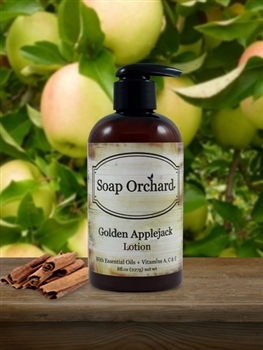 Golden Applejack Lotion contains apple extract. It's scent has notes of Cinnamon and Clove with the mellow scent of Apple. Your skin will enjoy this vitamin packed lotion. 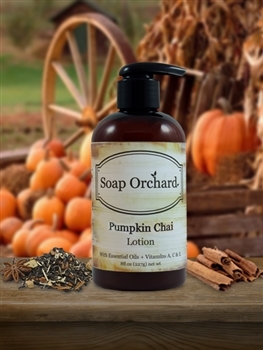 Pumpkin Chai Lotion has Pumpkin Seed Oil which contains high amounts of Zinc and Vitamin E. You will love the sweet and spicy scent of Chai Tea and Pumpkin with hints of Nutmeg, Cinnamonm, Vanilla and a bit of Allspice. 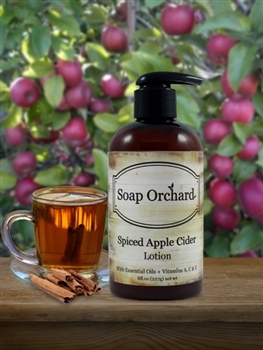 Spiced Apple Cider Lotion is loaded with Vitamins A, C, E and Zinc which are essential for glowing, healthy skin. It has a warm, spicy scent from Clove and Cinnamon and the sweet scent of Apple. Wonderful for dry skin in the cold winter months. Spiced Apple Cider Soy Candle, has a spicy blend of Cinnamon Bark Essential Oil and Apple Cider fragrance. Curl up by the fireside with this one!